As such we serve more than 250,000 meals per year to the homeless in the Dallas area. focused on bringing Christ to the homeless. the SoupMobile does not receive (nor do we ask for) any City, State or Federal funding. We are based on the old fashioned church modeled during the time Jesus walked the earth. We depend on regular people like you to help fund our mission of 'Feeding His Sheep'. It only costs $5 per month to be a member of the SoupMobile Dream Team. Yes, that’s it—only $5 per month. Dream Team members your $5 can and will make a lifesaving difference in the life of a homeless person. 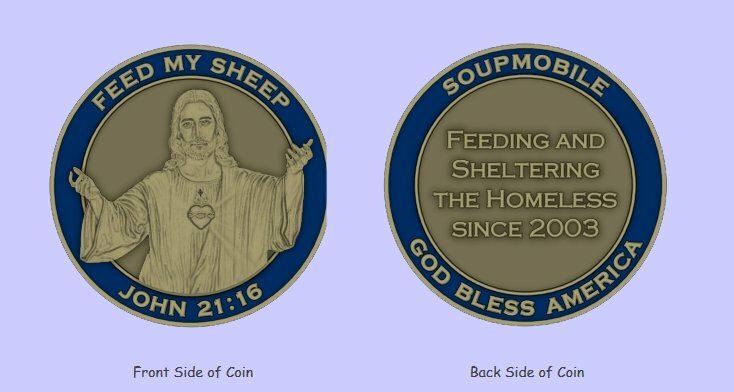 SoupMobile Commemorative Coin weighing in at an impressive 55 grams. Your $5 per month Dream Team membership will help us do that very thing. May the Lord Bless & Keep You & Yours.